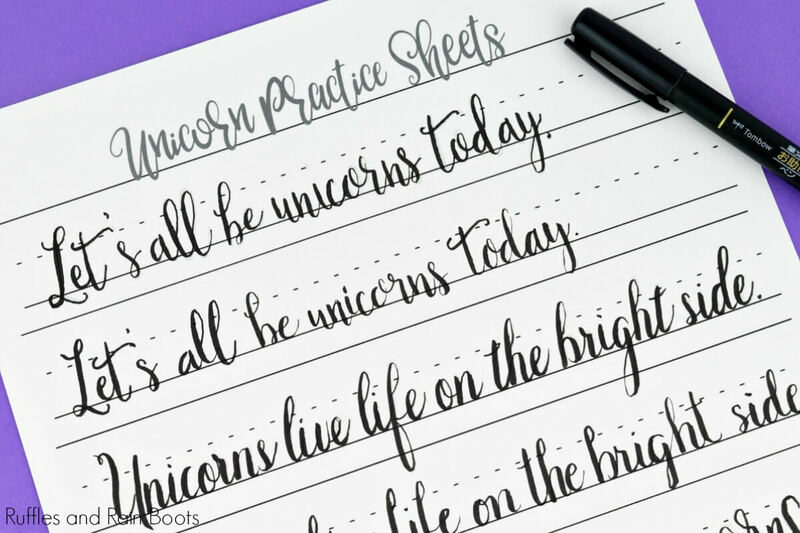 This free unicorn hand lettering practice sheet combines magical lettering with whimsical styles. The available set includes practice for small pen, large pen, and blending. 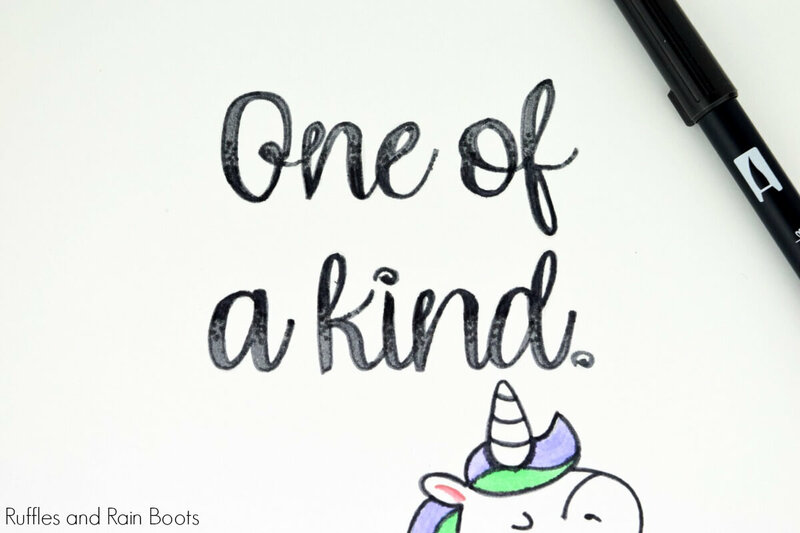 The free unicorn hand lettering sheet is finally available. Squeee! My little girl loves ALL things mermaid, unicorn, and dragons right now. We’ve been crafting with all of them here on Ruffles and Rain Boots. The full set of unicorn hand lettering practice sheets can be found in the shop. Psst: you get a coupon when you sign up for the weekly email here. If you need anything or want to try some new lettering products, be sure to check out my hand lettering shop on Amazon. I give you the exact products I use. Visit Ruffles and Rain Boots Hand Lettering on Amazon. Our hand lettering practice should be fun and, at the same time be challenging. Here are a few practice notes from my first session with this unicorn hand lettering practice set. Sure we all know that we go light on the upstroke and heavy on the down, but be sure to test letters with different pressure on that down. There is no hard-and-fast rule that says all of your letters need to be uniform. Sometimes it looks pretty cool when they’re not. If I’m going to do something, I want it to be enjoyable, and lettering practice should be fun. One of the ways I incorporated a bit of fun in this unicorn hand lettering practice set was to use a dotted ombre shade on the art print (full set). I know some lettering die-hards out there who despise faux calligraphy, but I think we\ should practice it. There is a different skill highlighted when building letters – steady, narrow lines. Grab a skinny pen (I prefer Micron .45) and get yourself to build the chunky letters by outlining them. Play with the loops, the bounces, and anything you can think of. All of it is good practice. I’m sort of, kind of, totally obsessed with lettering and I love to share the practice sets I create. Get on the email list and I’ll notify you when I make a new one! Sign up for the once-weekly Ruffles and Rain Boots newsletter. 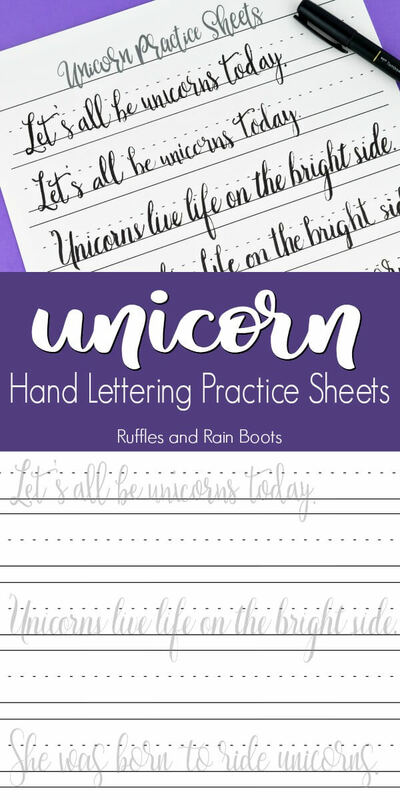 Download the free unicorn hand lettering practice page (small pen) here or go a bit further in your skill development with the full unicorn lettering practice set here.